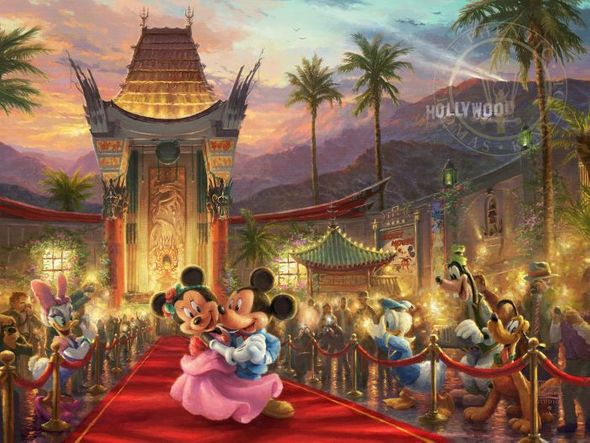 Thomas Kinkade Disney Limited Edition:"Mickey and Minnie in Hollywood"
About the Art Thomas Kinkade was a life-long admirer of Walt Disney and the wonderful characters he created. While Thom re-created many of his favorite Disney stories on canvas, he also envisioned classic Disney characters set within traditional Kinkade images. In these paintings from Thomas Kinkade Studios, his dream is proudly brought to life. In this flashing Hollywood scene, Mickey and Minnie walk the red carpet. The beautiful California sunset and stunning palm trees frame the setting for a one of a kind Disney celebration. Lights and cameras flash as onlookers gather to try to get a photograph of the famous pair. The happy couple waltzes romantically through the crowd as their closest friends gather to support them. Mickey and Minnie in Hollywood depicts one of Southern California's most iconic venues with a Kinkade flair.